There are some things I like to buy in bulk, and canned tuna is one of them. It's always a good thing to have when you want a quick lunch. Mix it up with a little mayo, some chopped celery, and maybe a bit of onion, serve it on some fresh greens with a slice of tomato, and boom, lunch is served. But as much as I love regular straight up tuna salad, sometimes I get bored with the same old tuna recipe. So I decided to come up with something a little more interesting. As I usually do, I took a quick survey of what ingredients I happened to have on hand, and then ran with it. This was the result! I figured this would be a win for anyone who might be choosing to do meatless Mondays, or meatless Fridays, or for those of us who do better without so many carbs. And they're delish! Full disclosure, I really had no idea what I was doing when I was throwing things into the bowl. I know crab cakes usually have bread crumbs in them or on them (which is why they get all lovely and browned and crisp on the outside when you fry them). I didn't want to do bread crumbs, so I tested a couple with a coating of cheese on the outside hoping to acheive the same result, but I found that you don't even need it! They browned beautifully just from the cheese that was already in the mixture. So I hope you'll give this one a try. Feel free to tweak it to suit your own tastes, and be sure to let me know if you discover any yummy new variations. I love to hear about it! Ok then great then thanx then!! Simply stir all ingredients together until everything is well combined and the tuna is well incorporated. Let the mixture stand for a good 5-10 minutes. Heat up your skillet with a little oil or melted butter. (I like to use a cast iron skillet). Scoop up some of the mixture by half cupfuls and place in the skillet to form patties. Let them brown for a few minutes and then flip to do the same thing on the other side. Serve immediately or keep in a warm oven until ready to serve. Be sure to let the mixture sit for a few minutes before going to the skillet because the cheese will work like bread crumbs to bind and tighten everything up a bit. Serve with tartar sauce or cocktail sauce, just as you would serve crab cakes. I like them with a bit of mayonnaise mixed with horse radish or horse radish sauce. You could also serve them on a bun as tuna burgers with a slice of tomato and some fresh lettuce. This recipe makes 4 or 5 large patties, but you can easily make them smaller for sliders. There's no need to add salt because the cheese is salty enough. Just sayin! You can also use canned salmon instead of tuna, and you can also stretch the recipe if you need to. Just add another can! People always ask me "Do you have any new recipes?" and I always respond with "Absolutely! what exactly are you looking for?" Most often, they'll say they want something that "is easy to make during the work week", or "only needs a few ingredients", or "will feed a crowd", or "doesn't dirty a lot of dishes." Most times, when I'm looking for a recipe, I want something delicious and hearty and comforting. This recipe is all of the above! And it's so easy, anyone can make it! It always seems to hit the spot, especially during the colder months of the year when you want something warm and satisfying. Hope you give it a try! I know you'll love it! Cut the uncooked biscuits into 8ths. Place into greased 9x13 dish. Cover with sauce, start with 1½ cups, add more if you think it needs a little extra. Bake at 375 for about 30-40 minutes. Before serving, sprinkle with Parmesan cheese and fresh basil, if desired. The original recipe as posted on Pillsbury.com includes a sauteed green bell pepper. I didn't include it, but you do you! Add whatever you like! Sauteed peppers, onions, mushrooms, all good! If you don't care about having to wash another bowl, you can stir all the ingredients together in a large mixing bowl, and then pour it into a greased baking dish before topping it with the mozzarella. I think it's a little easier to mix everything in a big bowl rather than in the casserole dish. Just sayin! When you bake the casserole, be sure that the biscuits in the center are done before you remove it from the oven. When I made it, the ones on the outside were fine, but the center ones were a little underdone. Just be sure to check that. Here's an easy recipe that you can quickly throw together when you're in the mood for something sweet. I made this one afternoon, simply because I was bored. I felt like trying something new, but didn't feel like going to the store, or doing anything that was too involved. (TBH, there are some days when I really feel like diving head first into an all day cooking project, but this was definitely not one of those days). This is a Martha Stewart recipe and it's exactly what I was looking for. 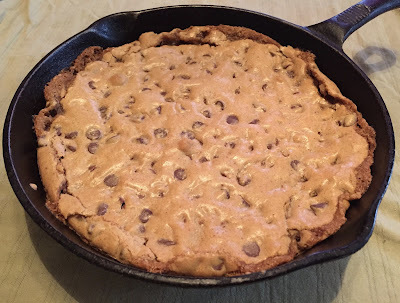 It only takes a couple minutes to mix up the few basic ingredients, then you spread the batter into your skillet, and boom, it's in the oven and making the whole house smell heavenly. It's perfect with a nice tall glass of ice cold milk after school or while watching TV. Sometimes the simplest things really are the best, dontcha think? In a large bowl, combine butter and sugars. Stir in egg and vanilla. Stir in flour, baking soda, and salt. Stir in chips. Transfer to a 10-inch cast-iron skillet; smooth top. Bake until cookie is golden brown and just set in the center, 18 to 20 minutes. Let cool 5 minutes. This cookie turns out very gooey. I wanted it to be a little more chewy than gooey, so I baked mine for a minute or two longer. Turned out perfectly! Vary this recipe just as you'd vary any regular chocolate chip cookies! Instead of chocolate chips, add nuts or M&Ms or toffee bits or white chips or chocolate chunks or any combination you like! I know I always say "more is more", but when it comes to chocolate chip cookies, I like to taste the cookie just as much as I like the chocolate chips. So I usually don't add more chips than the recipe says. WHAT??? Yes, I know, I know, it's crazy. Stop judging me. Do you love chocolate? Wait, let me ask that again. Do you LOVE chocolate? If you are someone who worships in the house of chocolate, then these are absolutely the cupcakes for you. They have a rich depth of flavor that you just don't expect in a simple ordinary chocolate cupcake. Yes, they are simple to make, but they are far from ordinary! When I saw Ina Garten making them on her show, Barefoot Contessa, I noticed that they only require a few simple ingredients (most of which I happened to have on hand). I also noticed that the recipe only makes one dozen, so it's perfect if you're making them for a small group. All things considered, I knew I'd be making them the next time I had a few friends over. (It's funny how I never get any complaints when I tell my friends I'm going to bake cupcakes!!) I made them for Kelsie, AJ and Matt, and everyone gave them a huge thumbs up! They're VERY rich and VERY chocolatey, kind of like if a brownie and a cupcake had a baby. So if you absolutely LOVE chocolate, you should definitely add this one to your repertoire. One can never have too many chocolate recipes, am I right?!?! Who's with me on this?? Line muffin pans with 12 paper liners. Preheat the oven to 325ºF. For the ganache, cook the heavy cream, chocolate chips, and instant coffee in the top of a double boiler over simmering water until smooth and warm, stirring occasionally. Dip the top of each cupcake in the ganache. Do not refrigerate. Instead of making the ganache in a double boiler, you can also heat the heavy cream in the microwave until very hot and then pour it over the chips and instant coffee. Don't stir it, but just let it sit for a few minutes and let the chips melt. Then stir until smooth and glossy. Oh, one other thing.. Miss Ina always uses extra large eggs in her recipes, but I only ever buy large eggs. So I just used 5 large instead of 4 extra large. Worked perfectly!